Do you want to ride comfortably and go far with much ease? You can consider the Raleigh Bikes Tekoa Mountain Bike. It’s the best companion for your fitness because it offers the efficiency of a bike. With the comfort of upright geometry, Raleigh Tekoa Mountain Bike will ease the strain on your back and neck. It also allows you to see the road ahead. You will use a little elbow grease on your new bike and learn how it works without having to begin from the ground up. This bike is well designed for mountain biking from one city to another. It ensures you ride quick and efficient because you can control the disc brakes easily. Its adjustable suspension gives you a sporty geometry making your ride more enjoyable. This is the mountain bike to help you move around the neighborhood with a super quiet and environmentally-friendly ride. This bike is fitted with mechanical disc brakes that provide you the best stopping power in all road terraces. The brakes are easy to maintain in all weather conditions. This gives you enough confidence to navigate through the neighborhood safely. With the excellent superior speed modulation and stopping power, the disc brakes are better in all-biking activities than traditional rim brakes. This feature will make a huge impact on your ride. Although the disc brakes get dirty, you can clean them effortlessly. Just use hot water, mild detergent, and a soft brush. Then rinse with clean water. The fork has 100mm travel that smooth out and flatten bumps while enjoying your ride. It gives you aa affordable bike ride and more control no matter what kind of obstacles are on the terrain. It has a more advanced damper with a wider range of adjustment and more scope for tuning. The 100mm travel is stiff enough and increases the quality of your ride. If you get bewildered about what gear you are in while riding, you can glance down at the chain and check. The bike is designed with 29” wheels to float you over rocks and bumps with ease and efficiency. The wheels speed, gears, and fender mounts keep your ride quick and efficient. These wheels have a strong and tough design that allows them to with withstand the abuse of trail. The design and size of the wheels allow them to keep rolling. This bike is well mounted with double wall rims made of an advanced aluminum frame. The wall rims are strong and light to hold your weight in the right position. The rims also reduce your rotational weight while riding and go faster for less effort. For biking disciplines as well as downhill racing, your bike rims must be strong and wide enough to prevent folding. The Raleigh Bike has unfailing wall rims to suit all your riding needs. The type of rim you select should be matched with the type of your riding. These bike rims are of good quality and are the best for beginner bike riding activities. The adjustable suspension of this bike allows the wheels to roll up and down while absorbing small bumps. This feature also keeps the tires in intimate contact with the track to give you better handling and control. The adjustable suspension enables the bike to absorb huge shocks while landing jumps in uncertain terrains. The front adjustable suspension of your bike clutches the wheel and grips the tubes that attach the frame of your bike. When your bike strikes bumps, the springs are compressed, while the piston pushes a fluid across the orifice to absorb all the shocks. Riding a bike is always a lovely exercise, but not all mountain bikes will offer you a similar experience. Even if you are highly skilled, you will require a powerful and comfortable bike. You can fully rely on the Raleigh Bikes Tekoa Mountain Bike if you want to ease your everyday activities. You can also use this bike as a supplement if you do not want to drive. A reliable bike is worth the value of your cash. 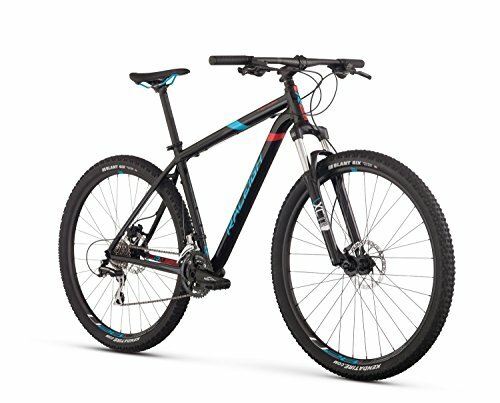 This reliable cheap mountain bike is the ideal average as well as above average users.